But while the city wants us to look at the waterfront and comment (click right here) on the need for a giant ice-rink, or a giant tent for shopping in, or for the need for designer loos shaped like a wonky lobster, perhaps it is time to look at the what is going up there now? How is that Whare Waka for you? For me: it’s looking quite exciting – but also, quite big ! Crikey ! There’s a basement (for the beers / taonga?) and a whole lot of massive concrete columns and some crazy steelwork going up. I think it is going to be fabulous – just a lot bigger than I had thought from those dinky little perspectives. What do you reckon? That’s one big Mother Waka (Mother Ship). PS, got any plans of the Whare Waka, I tried to do a search for them but to no avail? 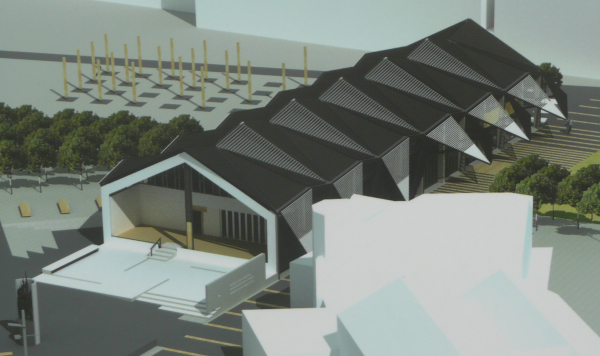 It does look large compared to the renders produced – you had to look hard at the elevations to see the true scale of it� but as long as things actually happen in and around it I think the Whare Waka should be a fantastic addition to the waterfront. The need for it at all. Size: modest and in keeping with teh adjacent buildings & spaces. Placement: aligned with St Johns bar & Kupe statue, positioned to give some structure to the public spaces. The need for it at all: Something that gives intamacy and definition to otherwise formless public spaces? A place to store and celebrate the ceremonial waka? 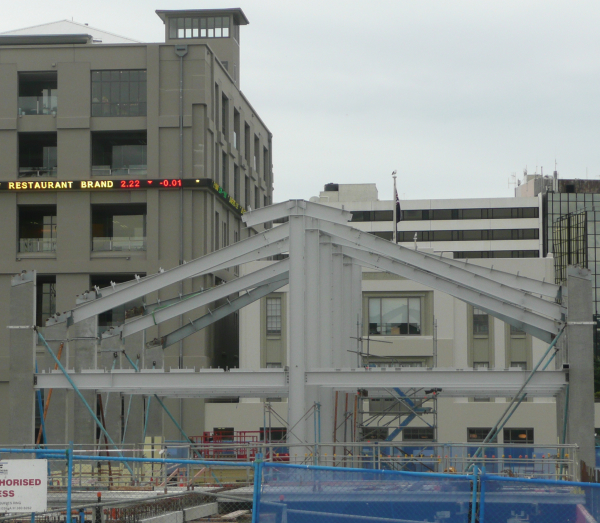 The only built representation of Maori culture on the waterfront? An interesting piece of conteomporary architcture? A functions space and cafe that faces across the lagoon to the city & settng sun? Waterfront Development Plan is being consulted on (again) so soon because last year’s was only a one year plan and it was late in the year (in fact the consultation was Novemberish) so this year it’s on track timewise. There are several elements that I think are very much up for grabs, the temporary acitivities (tent and ice rink) being in that category. We don’t yet have a business plan that says ‘viable’ or ‘not viable’ yet. My suspicion is that the tent in particular will be marginal at best if it’s likely to be there for only 5 years. 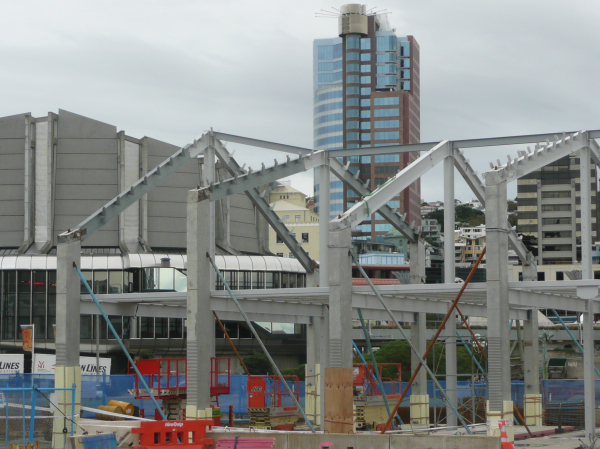 Alongside the wharewaka the work to complete Taranaki Wharf is also programmed. It includes extending the lagoon a bit closer to the wharewaka, so as to align with launching areas and seating. There’s also a direct wide walkway from the City to Sea Bridge running directly to/past the wharewaka (saving wet muddy feet crossing the grass !) Your collective thoughts very much appreciated. On Manners Mall I’d also be interested in you expanding your comments. I supported it as an improvement for PT and a key part of delivering a PT spine right through the CBD. That means we need to go back and revisit the ducking by the majority of councillors of Courtenay Place bus priority a couple of years ago. 1 – The proposal allows general eastbound traffic (ie exiting Boulcott St) down Manners St to Victoria St. Sure that will be somewhat better than the existing situation for motorists but mixing significant volumes of general traffic with the buses will certainly undermine the very PT efficiency the Manners Mall project aims to achieve. It would also require another light phase at Victoria St – slowing up northbound buses. We do need to provide for cars in the CBD, but increasing the volume on the Golden Mile doesn’t make sense, logically, and is not in accord with the Nguaranga to Airport Strategy. 3 – The proposed changes to Taranaki – Courtenay intersection (under construction) including taking out pedestrian islands look to make pedestrian danger worse, rather than better. This is as pointed out by the AA, the worst black spot in the city. 4 – On the more posiitve side there is recognition of the opportunity to link the redeveloped Lower Cuba St across Wakefield St into Civic Square. 1 – Manners St (at present) gets choked with traffic, and it has 2 lanes flowing one way. Surely it has to be a clearly stated principle that there is no way on earth that with a bus lane of one lane each way, that you would want / allow anything other than buses only down there. That’s just such a basic simple premise, that it makes me wonder about the rest of the scheme. 3 – I went down to Courtenay / Taranaki at about 2am the other day, and it is mayhem, with drunken, half naked screaming from boys and girls alike. Major major issue, with or without cars. But a lethal combination with big wide intersection and several lanes of cars revving. The current scheme needs to be improved an awful lot…. You running for Mayor yet? You should be.